Nearly 90% of the business smartphone market is covered by Apple and Samsung. This is the outcome of a market analysis by market intelligence specialist Smart Profile, whereby more than 2700 Belgian companies with more than fifty employees were interviewed. Apple and Samsung continue to dominate the business smartphone market. In 2016, Apple and Samsung covered 36.5% and 30.4% of the market respectively. When we look at their share in 2018, they account for 38.8% and 38.4% respectively, for a total market share of 87.6%. Huawei is the only other smartphone brand that registered a real increase in its market share. With growth from 3.2% in 2016 to 5.4% in 2018, it seems to be getting a foothold in Belgium. The other business smartphone brands fared less well in 2018. HTC (0.3%) and BlackBerry (0.5%) seem to be disappearing. Up to last year, Microsoft had taken over all smartphone activities of Nokia. This year, Nokia is an independent label and is included as a separate manufacturer in the analysis. But here too, the figures are not very encouraging with a 2.3% for Nokia and 1.3% for Microsoft. 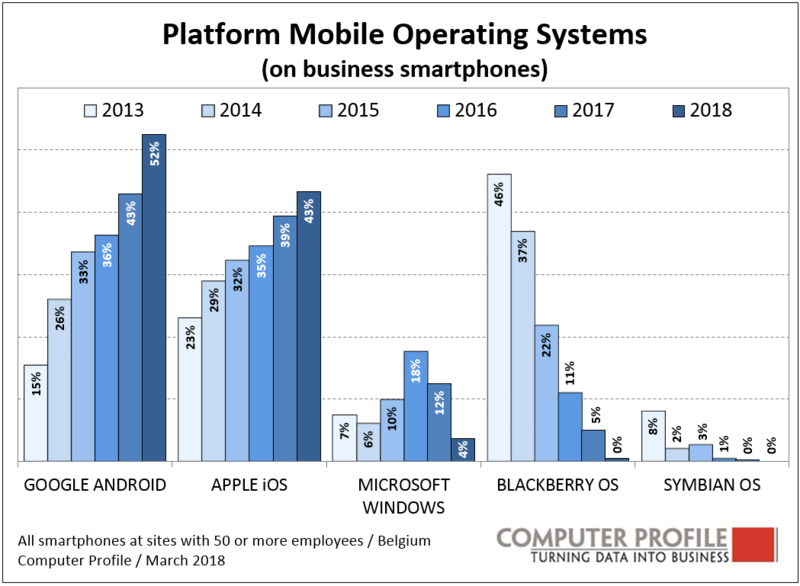 The rise and decline of operating systems for business smartphones are connected with those of the different manufacturers. Thus Symbian, BlackBerry and Windows 10 were blown away by iOS (43%) and Google Android (52%). The analysis also shows that users of Windows in 2017 switched to Google Android. Mobile Device Management, i.e. 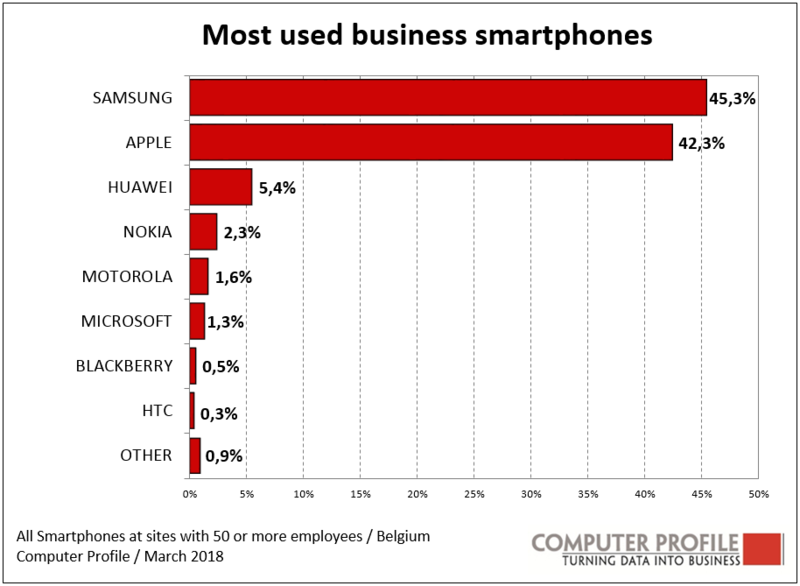 the management of all mobile devices in a company or organization, shows slow growth among all the Belgian companies interviewed. Use has increased from 5% in 2016 to 10% in 2018. 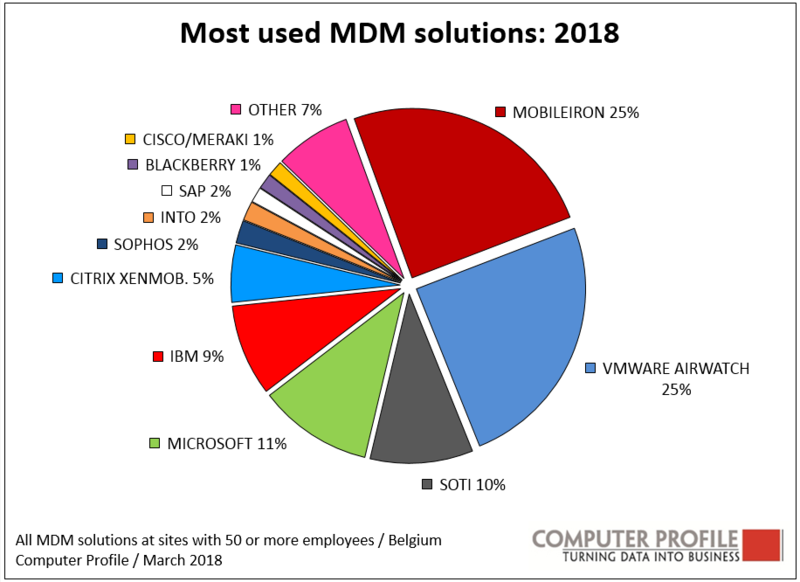 The largest share is attained in the large commercial companies: 21% of the multinationals and 15% of the Belgian national companies use MDM software. The sharpest increase (+7%) was noted among our national companies (i.e. companies with 250 to 2,500 employees). The leaders in the MDM software market are the Californian MobileIron and VMWare AirWatch, each with a 25% share. Microsoft is one of the only vendors that has registered a significant increase of 4.7% to a share of 11%. Soti and IBM have both lost a bit of their share but continue to account for ca. 10%.